Art Across The City takes place twice a year, commissioning temporary and permanent public art across Swansea, Wales, UK. The latest commissions open on 6th September and include Juneau Projects, Jacob Dahlgren, Laura Sorvala, Matthew Houlding. We are extremely pleased to announce the shortlist for our inaugural Public Art Open Submission. We received a large number of local, national and international applications from artists based in the UK, South Africa, Denmark, USA, Spain, Germany, Czech Republic, Switzerland, Sweden and Wales. The standard was extremely high with a wide and diverse range of exciting proposals. The eclectic shortlist contains proposals for sound works based on railway tracks, a dead philosopher’s skull, spinning plates, cartoon storyboards, a boiling kettle, reclaimed street furniture, viewing platforms and a colourful stairway to heaven. We were very impressed by the wide range of submitted proposals, who all approached the public realm in Swansea in inventive ways. We are now in the process of selecting one proposal with gallerist Ceri Hand and artist, David Blandy. We aim to make an announcement by mid-September with the chosen proposal appearing as part of our Art Across The City programme 2014. All shortlisted artists will be considered for future programmes where appropriate. Locws would like to thank all the artists who submitted proposals. Art Across The City 2013 programme opens on September 6th, 6.30pm, National Waterfront Museum, Swansea. 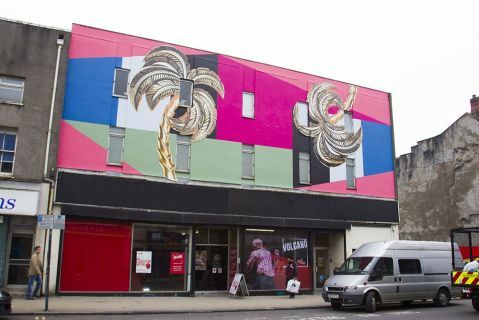 There are four new commissionsacross Swansea by artists Juneau Projects, Matthew Houlding, Jacob Dahlgren and Laura Sorvala. We hope you can join us for the launch. As British Summer Time finally decides to make an appearance, we have gone into office lockdown as we approach the next set of commissions as part of Art Across The City, Swansea. Whilst the nation swelters under the sun, we are looking out of small windows at people licking ice creams. It will be worth it. Even though the last set of commissions closed in June, the new ones will open on 6th September. Artists Jacob Dahlgren, Juneau Projects, Laura Sorvala and Matthew Houlding have come up with brilliant proposals which are all in production in our studio in Swansea right now. Each project has a lot of public participation or community involvement. From Jacob’s public processions to Juneaus fancy dress picnics, the public are central to the success of these commissions. So it’s a good time to announce a new member of staff, Lasma Poisa, who joins us as Arts & Outreach Coordinator. We have also announced a Public Art Open Submission, which we are aware is a matter of much discussion. This is outside of our normal programming (and funding) and we hope to make the process as open as possible. We’ve got great judges in Ceri Hand and David Blandy, a great fee and substantial budget. Public Art is a difficult area to negotiate, and we hope the Open will make it an easy access point to innovative ideas from artists of all backgrounds and experience. So, hopefully the sun will keep shining. We’ll be posting updates and interviews with the artists, along with all our outreach work. Locws International is pleased to announce its inaugural Open Submission competition for UK and international artists interested in working in the public realm. 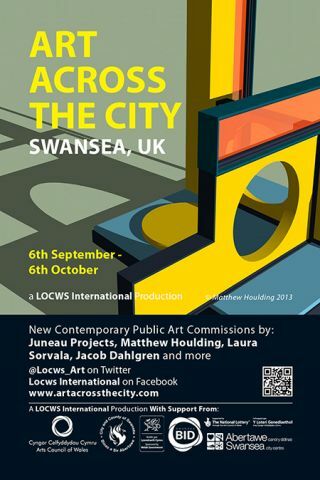 Artists are invited to submit a proposal for a temporary public artwork to be realised in the city of Swansea, Wales, UK, as part of Locws International’s Art Across The City programme in 2014. The selected artist will receive a £1,000 fee and a budget up to £2,500 to cover design, production, materials and installation, plus agreed expenses. Ten artists from the Open Submission process will be shortlisted with one being selected by the judging panel to develop and deliver their proposal. All shortlisted artists will be considered for future Locws International events and commissions. / Intended production methods, materials, etc. Please note, experience of working in the public realm is not essential, but please reference this in your proposal, and why you feel your work may be suitable. The 10 shortlisted applicants will be notified in August 2013. The successful applicant will be informed by September 2013. 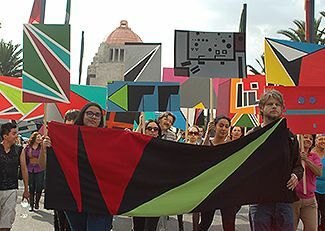 The commission will be completed in April 2014, as part of Locws International’s Art Across The City programme. Juneau Projects are artists, Philip Duckworth and Ben Sadler. Their idiosyncratic take on nature, technology, music and art comes to Swansea in the shape of five plywood sculptures attached to a copse of trees in Singleton Park. This will become the beacon for a series of events mixing bird spotting, pirates, fancy dress, storytelling and picnics. 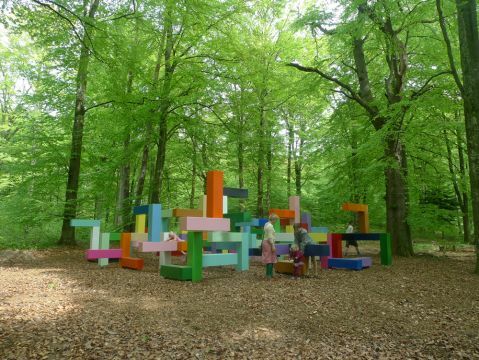 Juneau Projects were included in the Tatton Park Biennial, Cheshire, in 2012. Laura Sorvala brings ideas to life via graphic recording, visual facilitation, illustration and design. She will undertake her largest work to date, a 8m x 8m cube situated in Swansea City Centre. This will capture and illustrate the many different people and stories of Swansea in Sorvala’s unique style. A live onsite drawing event will take place during the exhibition. Sorvala has undertaken commissions for Chapter, Cardiff; Ecod Design Wales and Diffusion Festival. Matthew Houlding’s sculptures and collages draw us into a fantastic, retro-futuristic world, inspired by architectural forms and models, modernism and a childhood spent in East Africa. Situated opposite the Guildhall, Swansea’ Houlding’s work not only mirrors the building but references the nearby beach. Recent exhibitions include, The De La Warr Pavillion, Bexhill on Sea, New Art Gallery Walsall, ICIA, Bath. A full programme of participatory events, workshops and education programme will be announced shortly. Locws International is an artist-led registered charity that specialises in commissioning artists to work in the public realm. Initiated in 1999, we have commissioned over 70 artists.